You know those great ideas you have just running around in your mind ? The ones you know could be truly successful yet, you just aren't exactly sure how to take that vision and make it reality. Or what about the ideas that have actualized but, you want to take to the next level ? 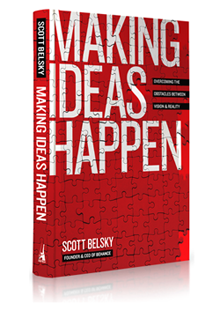 This book chronicles the methods of exceptionally creative, productive people and teams like GOOGLE to Make Ideas Happen. It encourages you to take everything up a level and tap into your creative self and your productive self and really make it happen. Worth a read for sure.